As you could undoubtedly surmise, I am a big fan of the fantasy genre. I’ll take a crawl through a dangerous, monster filled dungeon any day, and my board game collection shows it. Castle Ravenloft, Talisman, and Defenders of the Realm are among my favorite games, are a big part of the reason why I enjoy them so much is the fantasy theme. I recently picked up another dungeon crawl, the appropriately named Catacombs, but apart from the theme, it shares very little with its swords and sorcery peers in my gaming closet. 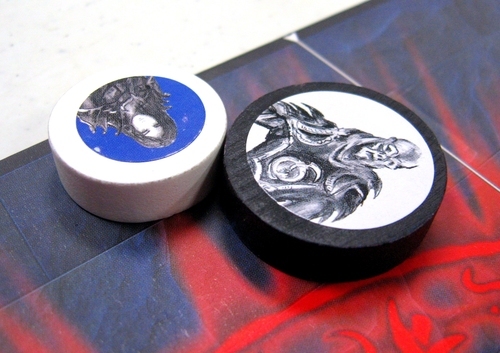 Catacombs is not a roll and move game, nor is it a light RPG with tons of miniatures. It is a dexterity game, a genre that is only otherwise represented in my collection by Jenga and Sorry! Sliders. What is a dexterity game? 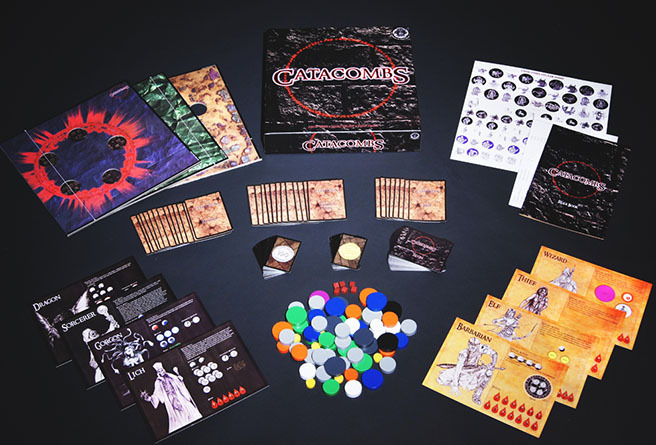 According to the authorities over at BoardGameGeek, dexterity games “often compete players’ physical reflexes and co-ordination as a determinant of overall success.” In Catacombs, players flick wooden discs of various sizes and colors around the board. 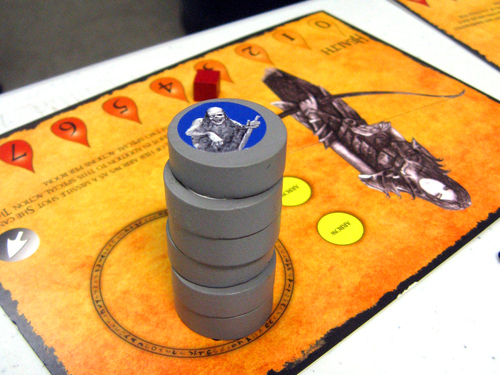 Four players control heroes, who team up against another player, the Overseer, who takes on the roles of the monsters and villains in the game. As the game progresses, the heroes flick and push their way through several different boards, defeating all manner of standard fantasy foes like skeletons and orcs, until the final confrontation with the dungeon boss, known as the Catacomb Lord. It sounds strange, but in practice, the game is incredibly clever and quite innovative. The standard elements of fantasy games are present, but all converted seamlessly into the flick and bump system. Players can attack via melee by flicking the disc representing their character. If an opponent is hit, they take damage. Many enemies can only take one hit, but others can take more, and are merely flipped over to indicate they are wounded. Once all the players take a turn, the Overseer can activate each of the monsters. When players are hit, they take wounds, recorded on their character sheet. The four heroes have different powers and abilities, brilliantly encapsulated in the game’s mechanics. The barbarian has lots of hit points, and can go berserk, flicking four times in a row, but is then incapacitated, losing his next turn. The thief can make a standard melee attack, and then take another flick to move herself back into a safe position. Missile attacks are the specialty of the elf, who can use a smaller disc representing an arrow to make attacks, while she stays safely back from the fray. The wizard has a full array of spell cards, including fireballs, magic missiles, summoning discs for skeletons and familiars to run interference, and many more. The variety in playing style between the four characters is excellent, and adds much to Catacombs’ replay value. The monsters, too, have many different abilities that enhance the dungeon crawling theme. Demons can shoot multiple fireballs, and the three-headed Cerberus can use three melee attacks in a row. Spiders can shoot webs, causing heroes to lose their next turn. 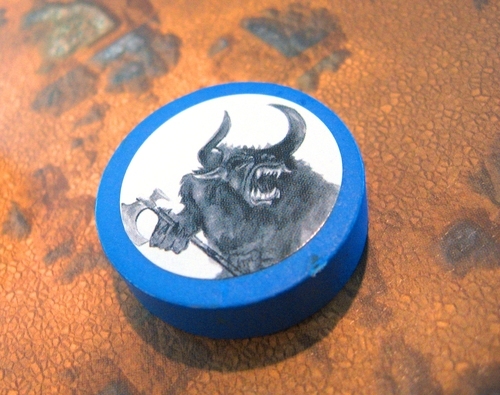 Minotaurs have the retaliation ability, which is particularly nasty: when damaged, they can make a melee attack in response, even during the players’ turn! The Catacomb Lords have even more impressive powers, like the Sorceress, who, when hit, requires players to draw a card randomly, with a strong chance that she avoids the damage entirely. There are three double sided boards included in Catacombs, allowing for six different types of rooms. Each board has holes placed that are filled with large discs, representing pillars and other obstacles. These barriers make for interesting interactions. You will use them to make crazy ricochet shots that will either fail miserably or perhaps take down multiple opponents with just one flick. The boards are set up according to the instructions in the dungeon deck, which varies from game to game. Periodically, merchants and healers appear, allowing players to spend gold (earned by slaying foes) to upgrade their characters and buy special weapons or spells. This, too, adds much to the fantasy flavor. I am extremely impressed by Catacombs. As a translation of the classic dungeon crawl into a dexterity-based flicking discs game, it is flawless. It’s dripping with theme, in a genre known for typically being abstract. If there is a flaw with the game, it’s the inclusion of only four playable characters. This need has been addressed in the expansion, Caverns of Soloth, which adds four new characters, and tosses in new Catacomb Lords and other cool bits to boot. It’s likely the most unique game in my collection, and should be of interest to any fan of the fantasy genre. Check out the rest of this month’s Game Night Blog Carnival entries here. Thanks to BGG user Chris Norwood for use of the pictures.